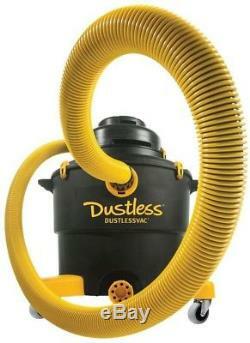 Dustless Technologies DustlessVac 16 Gal. The perfect partner for projects big and small, the 16 Gal. 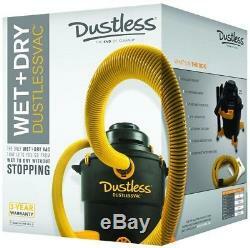 Wet/Dry DustlessVac allows you to go from wet to dry without switching filters and continued vacuuming. Wet/Dry DustlessVac is uniquely designed with a baffle inside the barrel to keep water away from the filters, and a check ball prevents overfilling. The patented filtration system of the Wet/Dry DustlessVac provides 2 layers of filtration for exceptional dust collection. The external agitator rod enables you to clean the inner and outer filters internally without opening the barrel for a faster, easier and more dust-free work environment. Best for capturing fine dust from drywall sanding and grinding/cutting of concrete, brick, stone or fiberglass, the 16 Gal. Wet/Dry DustlessVac provides powerful suction and intense durability to stand up to whatever the jobsite throws at you. When used with the optional WunderBag micro pre-filter, the 16 Gal. Wet/Dry DustlessVac captures particles down to 0.5 microns, amazingly close to HEPA filters that capture down to 0.3 microns. Machine-washable inner and outer fabric filters made for continued use and reduced replacement costs. Baffle feature inside vacuum barrel keeps water away from both outer and inner filters. Patented double filter system for exceptional dust collection. Barrel capacity to hold up to 40 lbs. Crush-resistant hose with removable cuff allows you to remove and replace damaged portions. Powerful 23,000 RPM, 11.5 Amp electric motor for lasting performance and suction. Quiet operation at only 81 dB. Check ball protects the vacuum motor from filling with too much. External agitator rod allows you to clean filters without opening barrel. Optional WunderBag micro pre-filter captures particles down to 0.5 microns and retains heavy-duty strength even when wet. Accessory/attachment storage built onto vacuum unit for easy access and use. Works with the following accessories: #13141 WunderBag micro pre-filter 2-pack, #13001 outer/inner filter set (1 each), #14251 12 ft. Hose, #14173 stub hose, #D5155 18 in. Hose adapter, 1.25 in. Hose adapt, #61005 ChipBuddie paint scraper, #D1900 bit buddie drilling shroud, #D1835 5 in. Dust buddie grinding shroud, #D1854 7 in. Dust buddie grinding shroud, #D1836 dustie grinding shroud, #50001 turbo sander, #D1850 dust buddie grinding shroud, #D1858 dustie + 7 in. Diamond grinding wheel grinding shroud, #D1838 dustie + 4 in. Diamond grinding wheel grinding shroud, #D5254 tool sync. Accessories included: includes (1) 16 Gal. Dustlessvac, (2) extension wands, (1) outer filter, (1) inner filter, (1) WunderBag micro pre-filter, (1) crevice tool, (1) floor tool, (1) 1.5 in. : 2.5 Hose Length ft. : 32 Air Volume (CFM): 126 Amperage (amps): 11.5 Color Family: Blacks Cord Length ft. : 15 Filter Type: Vacuum Floor Care Features: Built-In Accessory Storage, Built-In Drain, Casters Included Accessories: No additional accessories included Peak Horsepower: 5.0 Product Weight lb. The item "Dustless Vac 16 Gal. Wet Dry Vacuum HEPA Filter Dust Collector Floor Cleaner New" is in sale since Friday, June 22, 2018. This item is in the category "Home & Garden\Household Supplies & Cleaning\Vacuum Parts & Accessories". The seller is "store_vivian" and is located in Multiple Locations. This item can be shipped to United States, Canada, United Kingdom, Denmark, Romania, Slovakia, Bulgaria, Czech republic, Finland, Hungary, Latvia, Lithuania, Malta, Estonia, Australia, Greece, Portugal, Cyprus, Slovenia, Japan, Sweden, South Korea, Indonesia, Taiwan, South africa, Thailand, Belgium, France, Hong Kong, Ireland, Netherlands, Poland, Spain, Italy, Germany, Austria, Israel, Mexico, New Zealand, Philippines, Singapore, Switzerland, Norway, Saudi arabia, Ukraine, United arab emirates, Qatar, Kuwait, Bahrain, Croatia, Malaysia, Brazil, Chile, Colombia, Costa rica, Panama, Trinidad and tobago, Guatemala, Honduras, Jamaica.